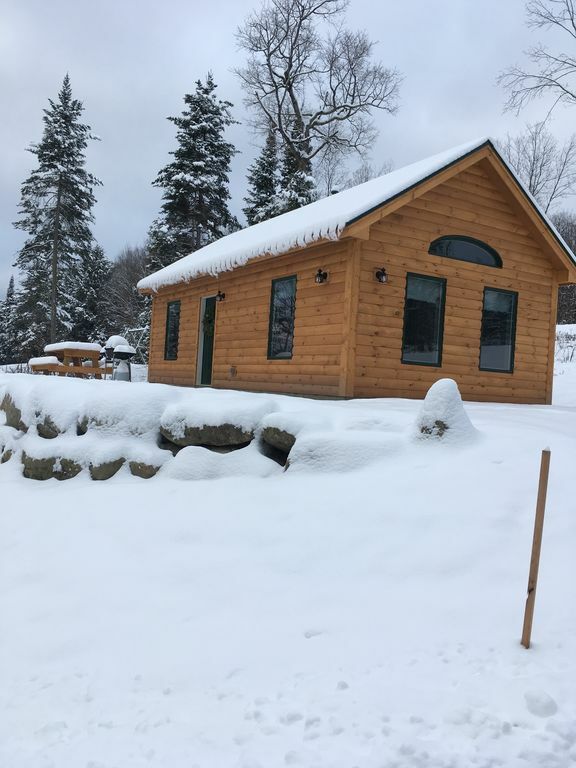 Our cabins are nestled in the woods of the Green Mountains and only a short distance from Stowe and Smuggler's Notch ski resorts, hiking/snowshoeing trails, lakes and ponds galore and several breweries. While you feel like you are removed from everything in the serene woods, you are only 3 miles from local restaurants and shopping centers. Each cabin is private with outdoor picnic and campfire areas. The inside has airconditioning, radiant heated floors, wifi, cable tv, a wet bar to meet your cooking needs and a large 6 foot soaking tub. Hi. We are Craig and Jennifer Fowler. We both grew up and raised our family right here in Lamoille County. We love to work on our 12 acre wooded land as well as hike, kayak, fish and snowshoe. Our property is centrally located in Vermont and basically within an hour of just about everything. There are three ski resorts within 20, 30 and 40 minutes from us. We are 5 miles from Green River Reservoir, minutes from different long trail heads and there are 5 breweries within a 15 mile radius. We are located on a country road in the woods, but only 3 miles from restaurants, breweries and local shopping centers. You will love looking out the large windows or being outside enjoying the campfire or the singing of the birds. toilet, combination tub/shower, We have a 6 foot soaking tub. We live on a back country road nestled in the woods but only 2 miles from shopping, breweries and restaurants. It is a beautiful ride to our property with some hillside views and farmland. We have a wet bar set up with a microwave, mini fridge, toaster oven, crock pot, electric fry pan, hot plate and an outdoor grill. We have a table and chairs set up near the kitchen area. We have a few animals and blocks if you request them. Very nice and very clean! We’ll be back! We had a great time and the location allowed us to easily ski at Smugglers Notch and at Stowe. We will be back next year!! Good communication. Nice cozy feel. Comfy bed. Lovely location. Wonderful location. Great hosts. Would highly recommend. We really enjoyed the Stay at the Cabin. We were very excited to find a place that would allow us to stay for one night for a lacrosse tournament. It was a great find! Very easy to find, nicely decorated, clean and very peaceful! Thank you Kelli. We are glad that you enjoyed yourselves. Maybe you will have the opportunity to stay longer next time. It was great having you. Thank you for leaving the cabin in great shape. We have a binder in our cabin that has the local eateries and activities listed along with maps.